WARM IS THE WORD: Temperatures are mostly in the 81- to 85-degree range across Alabama this afternoon with a partly sunny sky. Clouds will increase across the state tonight ahead of a cold front. The front will bring showers to the state on Friday, mainly during the morning. There is little upper support for the front, and moisture will be limited, so rain amounts should be fairly light (less than one-quarter inch for many places). A decent part of the afternoon should be dry with only isolated showers. Otherwise, Friday will be cloudy and not as warm, with a high in the mid 70s. 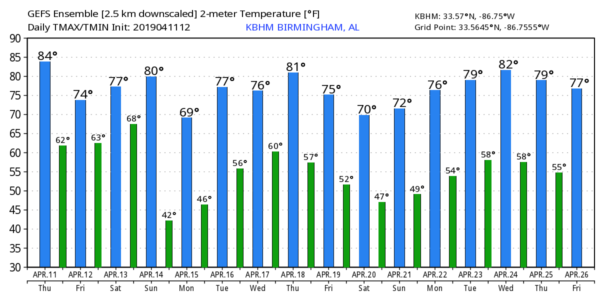 THE ALABAMA WEEKEND: The front will lift northward Saturday morning as a warm front over north Alabama, and some rain is likely. But by afternoon the front will be over Tennessee, and most communities will be dry, with only isolated showers. With a mix of sun and clouds we project a high in the low 80s Saturday afternoon. Sunday still looks like a very active weather day as a potent weather system approaches from the west. A deep surface low will move north and west of the state, supported by a vigorous upper trough with strong wind fields. The Storm Prediction Center has most of Alabama at risk of severe weather on Sunday. We believe the main window for severe thunderstorms will come from roughly 3 a.m. until 3 p.m. Sunday. The initial threat will be over west Alabama, shifting eastward during the day. Storms will be capable of producing large hail, damaging winds and tornadoes. It is important that you place yourself in a position to hear severe weather warnings Sunday, and take some time to review your family action plan. Know where you are going and have helmets, portable air horns and hard-sole shoes for everyone in that safe place. If you live in a manufactured home, identify a shelter or other site-built home or business nearby that is available on weekends and during pre-dawn hours. And every church must have a way of hearing warnings (NOAA Weather Radio is the best bet) and have a plan to get people into a safe place in the event a tornado warning is issued and the church is in in the polygon. NEXT WEEK: Monday and Tuesday will be dry, with cool mornings and pleasant afternoons (lows in the 40s, highs in the 70s). Showers return Wednesday, and another vigorous storm will bring another threat of strong to severe thunderstorms by Wednesday night and Thursday. It’s way too early to be specific — just something to watch for now.